I would be lost without my friends, especially those who understand how hard it can be to be a parent and how important it is to have time out and a chance to let your hair down. Not that I have much hair to let down but you get what I mean. I have three particular friends who are exceptionally adept at letting their hair down, usually with the assistance of cocktails, but when I tell you we have 19 children between the four of us, you can see why we might want to have some child free fun every now and again. Still, even on our wildest nights we have never come close to the antics of the characters in the movie, Fun Mom Dinner, out on digital download via iTunes, Amazon Video, BT, Google Play, Microsoft, Sky Store, TalkTalk, Sony, Ubiquity and Wuaki this week. Four moms, whose only common ground is their kids' preschool class, arrange a fun mom dinner with the sole aim to drink wine, gossip, and bond without worrying about their kids, husbands and housework for the night. 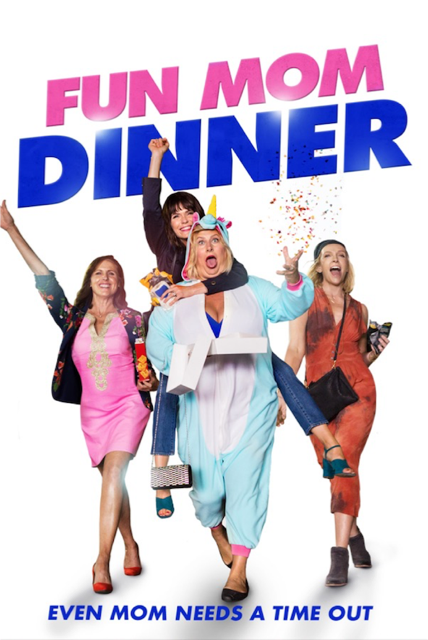 The dinner guests include the newly divorced Jamie (Molly Shannon, Divorce), super mom Melanie (Bridget Everett, Trainwreck), the stressed-out Emily (Katie Aselton, Legion), and Emily's best friend and social outcast Kate (Oscar Nominated Toni Collette, Little Miss Sunshine), who was more than a little reluctant in accepting the invite. The movie is rated 15 but I'd better mention that the language and the subject matter is often quite adult so be warned! This is not a film for the sensitive snowflakes but as one who has worked in a newsroom and is very used to some sweariness I was not at all offended. In fact I'd go as far as to say I found it all hilarious - I loved the moms, the side story of how the men were coping left with the kids, and the way the rather unreal plot played out. There are hunks and some cheeky bits and quite a lot I could relate to as a veteran of the playground at school run time. I can't wait to watch it again with my mates! This movie was just what I needed after a stressful rainy day at home with bored children. I ate pizza and chicken wings and watched it roaring with laughter! Download it now and save it for an evening when you can't get out with your own mom friends or even better, invite them round. Now where can I get myself a unicorn onesie......? Disclaimer: I received the digital download of Fun Mom Dinner free for the purpose of this review.